and "One for Don Cherry" by Billy Bang. 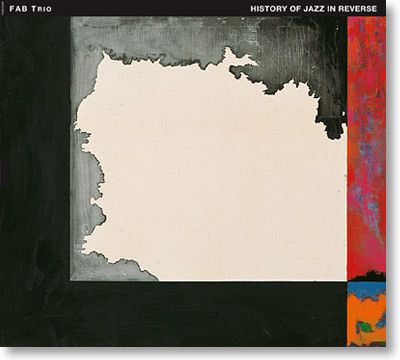 FAB Trio's album History of Jazz in Reverse marks another historic meeting of three improvisers and legends of the New York jazz scene, bassist Joe Fonda, drummer Barry Altschul and violinist Billy Bang, who have for decades been known the world over as masters of their craft. With the FAB Trio, they forged a unique common language that reached its peak on this recording. Sadly, Billy Bang (1947-2011) succumbed to cancer and passed away in April 2011, just as this recording was being prepared for release. However, he left behind an extraordinary legacy in modern jazz music, including this album that features some of his finest playing in the studio setting. With the exception of Bang's One for Don Cherry and Compay Segundo's Chan Chan, History of Jazz in Reverse is based on the trio's collective improvisations recorded "live in studio". And with just violin, bass and drums, the FAB Trio is able to wring a full spectrum of colors. That is no surprise as, by the time of this recording, Bang, Fonda and Altschul had, among them, spent a century on the road - performing, recording and improvising.